On contrast to Egypt's Red Sea Riviera, its Mediterranean coastline is totally plain with low altitude shrublands along the region, except for the westernmost portion which is formed by the 400m-high Marmarika Plateau. It is also characterised by the occurrence of Egypt's five northernmost lakes. The region has typical Mediterranean flora and fauna on land and in marine life with the weather being between pleasant and hot during summer and mild in winter. The region receives the most rain in Egypt, hail and sleet fall rarely in winter. Snowfalls occur in some inland towns and locations. Even though most of Egypt lies within the hot desert climate (BWh) according to Köppen climate classification with little precipitation, prevailing winds from the Mediterranean sea greatly moderate the temperatures of the northern coastal line, making the summers moderately hot and humid, while the winters moderately wet and mild, when sleet and hail are also common, in and around the wettest places, as Alexandria. Temperatures range between a minimum monthly average of 9.5 °C (49.1 °F) in winter and 23 °C (73 °F) in summer, while a maximum monthly average of 17 °C (63 °F) in winter and 31 °C (88 °F) in summer. Sallum a border town at Libyan borders. Baqiqi a fishing local village. Sidi Barrani a snowy town, and Egypt's closest inhabited settlement towards Europe and Greece. Shammas a fishing local village. Zawyet Umm El Rakham a village with archeological sites. Marsa Matruh the main seaport on Egypt's Western Mediterranean coast. Fuka a village famous for excellent Mediterranean fruits and touristic beaches. Sidi Abdel Rahman a new touristic seaport town with a number of leading resorts like Hacienda bay and white, Marassi (made by Emaar), Lazorde and Diplo. Marina, Egypt a leading Egyptian major resorts town, and host site of Ancient Egyptian and Roman monuments. Alexandria the main Mediterranean city and seaport. 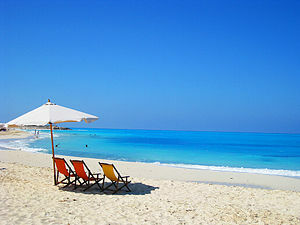 At the center of the entire Medi coastline and the second largest city in Egypt. Rafah Egypt's last eastern Mediterranean city on the borders with Gaza Strip. ^ Al-Aees, Shaimaa (5 November 2018). "Inertia Holding earns EGP 4bn in Jefaira North Coast project sales since launch". Daily News Egypt. This page was last edited on 18 December 2018, at 14:35 (UTC).